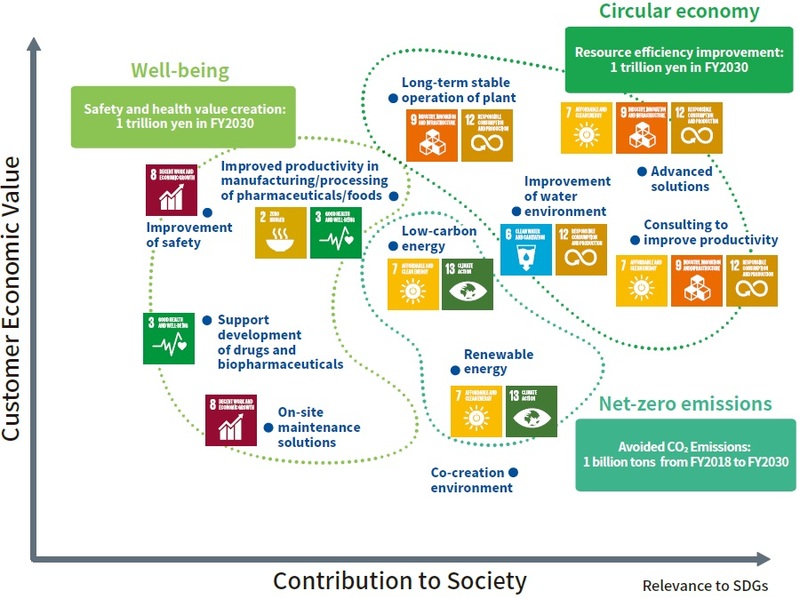 Value Creation Stories of Yokogawa have been collected and categorized into value creation themes according to value creation type from the standpoint of the Three goals and the SDGs. We have evaluated these themes on a scale of customer economic value and contribution to society (social/environmental value). Based on our evaluations, we set three business focus areas related to Yokogawa Group initiatives and aspirational targets for the year 2030. We offer solutions for renewable energy and safe, highly reliable control systems for greater LNG supply chain efficiency, contributing to reduced greenhouse gas emissions. We expertise solutions ranging from research and development to production and distribution services, facilitating safe and healthy lifestyles for all. We offer digital technology consulting and advanced solutions and supply a range of long-life, environmentally-friendly products designed to ensure operational stability and efficiency throughout the equipment life cycle. We improve human resources management to make our transformation within the group and create new value and environmental management to conserve the global environment, which is essential for the existence of our business.